I did a few of the “Sol Lewitt Game Rules” to varying degrees of success, however, upon hearing about the purposed mods some of my classmates purposed and thinking about my own experiences with mods and modding different games I wanted to further explore this idea of the “Game Art Mod” and revisit this idea of modifying a game with a more nuanced and artistic frame of mind. 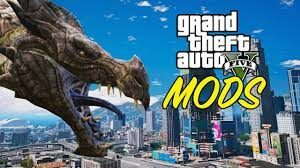 Given that, the idea that keeps popping to my head is a mod for the Grand Theft Auto though as of now it does not yet have a working title. In the mod, the player is transformed from the perpetrator of all crimes to the victim. Instead of stealing cars, your car is routinely stolen and so you must walk, bike, or taxi to the nearest police station to report it. Then over a span of 1-14in-game days, the player would get various news about their stolen car and deal with the situation accordingly. This news could be anything, the car was destroyed and you have insurance, it was destroyed and you do not, your car was returned safely, or your car was returned with money/drugs inside, at which point you must then surrender your car to the police as evidence. Either way, the player is once again a recognizable member of the community and yet this time as the nonviolent unthreatening normal-yet-unfortunate person that everyone would recognize, but few would know the name of. The mod of the game would still tie the player to all the action-packed and eventful happenings of the regular storyline and yet they will be a victim in each one, a severe case of “the wrong place at the wrong” time if you will. 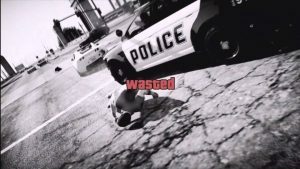 In the event of a shootout or a police fight the player may get injured and instead of respawning normally after a “wasted” sign, the player would instead respawn in a hospital, confined to bed with a stay ranging in both duration and price. During regular play, the player follows a daily routine of waking up, getting ready, going out, then coming back, getting ready for sleep, and then sleeping. During the time they are out they are given odd jobs and quests that naturally pull them to the violent and deranged events of the story. In this mod, stars would increase and decrease semi-randomly (partially influenced by story events) giving the player an indicator of what level of “mess” they are about to be pulled into. 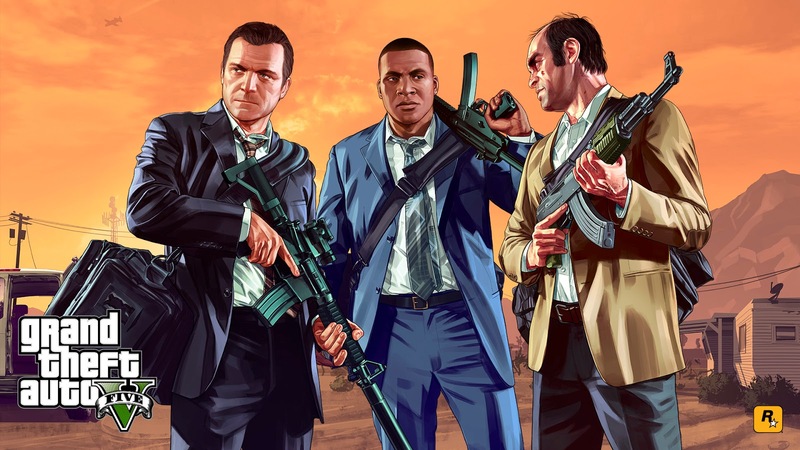 Throughout the gameplay, one would find themselves constantly strapped for cash as well as having their patience tested as they would have to spend long periods of time traveling without a car, whether by walking, taxiing, or the bus. Or by having the player spend actual real-life hours watching their character recuperate into the hospital. 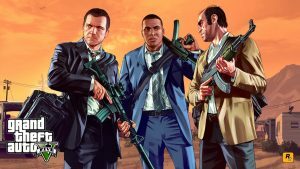 And it is exactly by doing this that we create a conversation about the GTA series about how it gives the player everything, money, power, violence and glorifies it all as if everything should belong to the player. The idea behind this mod is that it flips the script of the conventional GTA game, where we finally get a glimpse into lives of all those affected by the almost senseless and nonsensical violence of the games’ worlds. For the final project of this class, I proposed to finish my midterm project. The final product shifted greatly from the midterm project file. Initially, the game was constructed with a 2d platformer kit which the overall style of the game was sprite based with a pixel style. However, partially because of the ring menu system that I was trying to combine to the gameplay didn’t work well with the original 2d game system that I worked with and I’m not really familiar with constructing a 2d scene in Unreal, but most importantly, in order to emphasize on the feature of “exploring the city corners”, a 3d layout is much better than what I had before. This is a demo of the ring menu system that I was trying to combine into the gameplay. I haven’t figured out the activating/deactivating mechanism that is going to work with the leveling up of the main characters. Here’s a navigation through the map. I build a street that has corners and turns that has the potentiality of expanding to a full district that is big enough for the player to explore. The characters are tied with animation as suggested but didn’t have enough time to add walking animation and trigger animation. For the final project, I dug too much into the trying to have the specific interface into the game that the overall mechanism. If there’s more time, I would definitely combine the mechanism in both projects together and make a complete gameplay. C. This version will more completely convey the concept as it will be a more in-depth and fleshed out experience. By adding and improving more content, the concept maybe is better experienced and explored. A. To complete the main gameplay, a final, end state is required, a resolution and visualization of the progress that has been made and the help that has been received as well as this, several more instances of refined pathways and situations in which help may be asked for and obtained. B. In terms of assets, more detailed background and new character sprites are expected. Most things within the space should be newly created or otherwise updated. Overall, the idea for my final is to better update my midterm and better accomplish some of the goals I had set and have yet to accomplish. 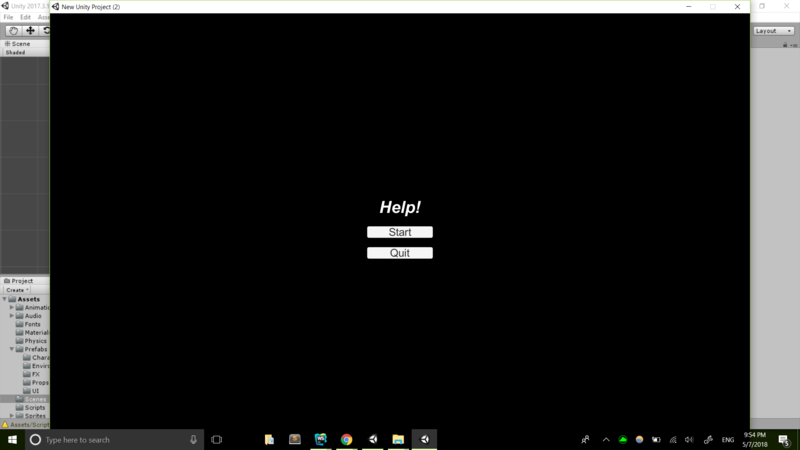 While striving to better myself with the likes of Unity and c# I’ll try to find better ways in which to express the main concept of the game which is “help”. Whether that be through refined instructions on how to obtain help and/or increased instances in which help may be asked for and obtained. I also want to set new goals in the form of better or more consistent assets and overall I want the game world to have a bit more movement and depth. All in all, I am still growing as a Unity developer so I want to take this opportunity to further flesh out the ideas I had previously to a level that I would feel is more representative of what I am able to accomplish and more showing of the effort I want to put into this game. I look forward to the future with confidence and hope that even if all the categories are not fulfilled I can be proud of what I will have accomplished and that I attempted to fill all the categories to an extent I can be happy with. Overall, my final project exceeded my expectations in some ways and failed to reach the mark in others. From the beginning, I imagined my Art Game as a means to have some sort of interesting interaction with the concept of asking for help. Overall, while I did find immense pleasure in figuring out the scripts of the game and becoming more comfortable and confident with c# and unity, in general, I still found that clever tricks and interesting gimmicks did not quite match the level I wanted from the experience. 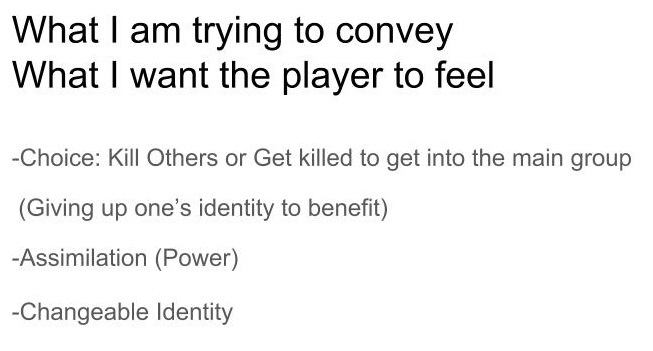 According to feedback from the presentations, in the situations where the player is offered help, it often seems like asking for help is the only option lest the player choose instead to face a death most cruel and uncertain, and this is feedback I wholeheartedly agree with. The point of the game was to show that throughout life we will constantly progress from point A to point B and that asking for help can be a beneficial member of that experience. The player was always supposed to have the option to choose, to choose help, to choose TO help and that choice is something that I think fell rather flat in the actual gameplay. Other challenges in the process included determining the use of various scripts and getting along with the intricacies of Unity and c# themselves. Things such as compiler errors, transferring data values between levels and scenes, or even the copious amounts of Apple line endings that would come about as I hammered away scripts on the Windows laptop of my choices were all obstacles that did indeed impede my path. From meaningful instances of UI elements on OnCollisionTriggers and terrain movement, there were many things that while daunting at first found themselves conquered and understood and it’s here that I believe I accomplished the most. Thinking to myself: “it would be great if the game could do this or have this” and then being able to piece said “this or this” together using the online resources and knowledge gathered always brought a sense of accomplishment and with every passing instance I felt that I could do more, accomplish more, and in the end, what came out was a final project that I believe was more technically advanced and interesting that I thought it would be, even if it missed hitting home where I wanted it to. Other feedback included that by increasing the number of instances where help is offered and by increasing the difficulty of the situation in which help is needed, the initial instances of help could be used as an introduction to the system leaving the development of the concept for future instances. I think this is also great feedback and it is something that is often seen in games, where systems are introduced at their base levels and then slowly developed as the game progresses. The final feedback was about the inclusion of a narrative as an alternative to strengthen the concept of “help” and most feedback concluded that a narrative poorly written and brashly thrown onto a project would serve more to hamper the game and concept, rather than promote their development. As someone who has always believed that a narrative was one of the factors that elevated video games to a higher level, I too found myself once more in agreement. All in all, I am very happy with the progress I have made. Though the journey was long and tiresome, I truly believe that I learned a lot and though there are still much more to do and accomplish, I know I have further progressed towards that goal. The purpose of the game is to have the players been in the dilemma between emotional needs and morality as well as the balance between emotional loss and gain, by creating similar situation that differ in the detailed narratives. The theme is “travel”. 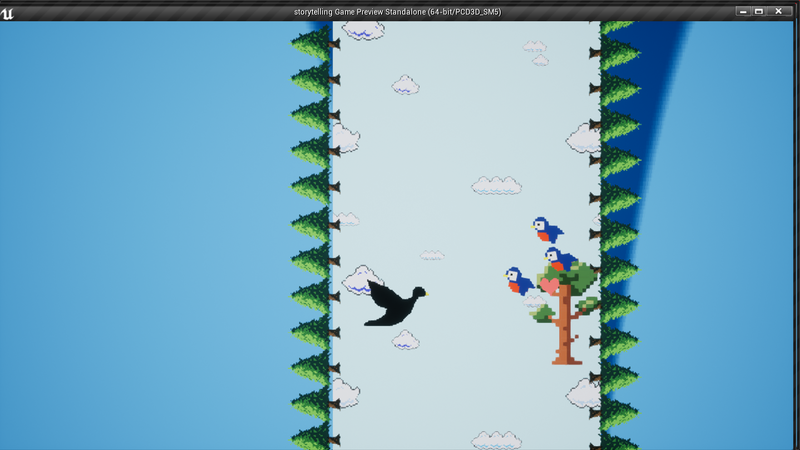 The player’ s role is a lonely wild goose, traveling aimlessly. In the trip the wild goose will meet other kinds of bird in different period of the game. In the first period, it will firstly meet another lonely sparrow and they become companion. Then they will meet another several single sparrows, also joining them. However, after they meet a certain number of sparrows, the sparrows decide to settle down on a tree. Therefore, the wild goose has to leave them. Then in the next period of the trip, the wild goose will meet a beautiful injured swan. The swan then travels with the wild goose. In the trip they fall in love with each other, but the swan gets weaker and weaker. But then the wild goose and the swan meet the swan’ s family on a lake, thus the swan eventually leaves the goose. In the following periods of the game, the player will probably experience the same thing: meet a new friend, meet many friends (maybe not), then lose all of them. But the player can avoid losing of the companions if the player carefully controls the wild goose not to meet other birds when it already has a small number of companions. The player will often need to make decisions during the game according to the situations. If the wild goose meets many birds and become friends with them, the sense of loneliness may be eliminated, but the player is not sure about whether the next bird that the wild goose meet will cause the loss of all companions. Also, according to the narratives of different situation, sometimes it may be necessary for the wild goose to send the companion back to its family, like the injured swan. But the wild goose has fallen in love with the beautiful swan. Or when the player helps the family reunite, the player may gain a sense of satisfaction but the will goose will be lonely again. In short, the player will face many similar situations with different emotional struggles and dilemma, and he/she will have to make choices. 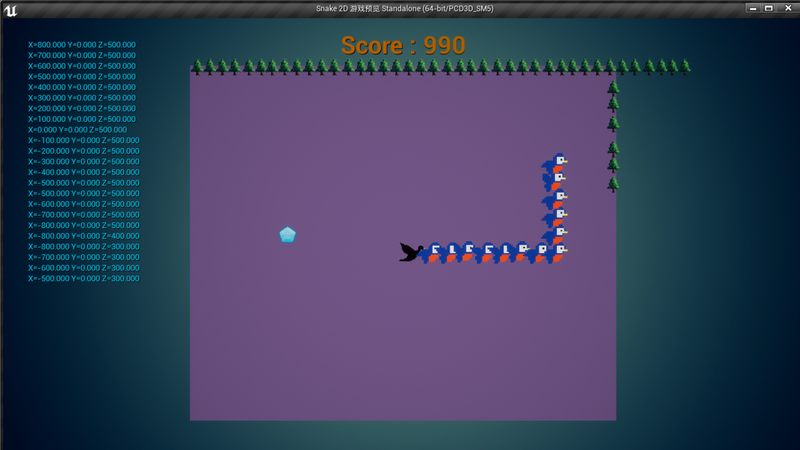 The game system is similar to the game system of Snake Game, 2D platform with a vertical camera view. The wild goose is like the head of the snake, the first one of the group. And each new bird the group meet will be added to the end of the group, increasing the length. The wild goose can move horizontally or vertically. And the part of the group that is still on the previous track will be fixed on that direction. But the game does not contain score system and it does not have an ending. The experience that the wild goose meets friends and lose them will repeat again and again if the group constantly touches new bird on the way. And if the player carefully controls the group not to touch other bird anymore, the wild goose and its friend will keep traveling together forever. The group body itself is not the obstacle for the player. I don’ t have score system because the concept of “obstacle” and “food” in the original snake game is more relative in this game. For the player who wants to find a friend, or who wants to help the bird family reunite, or who does not care about losing all the friends, collecting new birds is not a negative thing. But for the player who has a certain number of companions and does not want to meet other birds anymore, the birds then become obstacles for he/her. For the aesthetic approach, I do not want to use text to describe the story. I may use some simple animation. 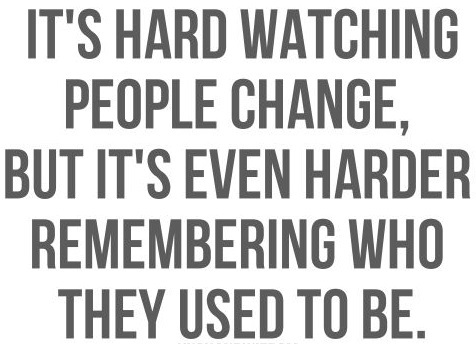 Like when the wild goose meets a new friend, their heads will touch, and their wings will flap. Then the new friend will join them. But the wild goose’ s friend will often leave it and flies on a tree, looking around, indicating that it misses its family. When the wild goose helps it find its family, the bird will flap its wings to the player and leaves him, flying to its family and there will be a small heart above the family. This kind of simple animation can implicitly tell the stories and leave the space for the player to imagine the situations and substitute himself/herself into the game. I will create the art assets. The game will be in pixel style. The image of birds will be simple. Also I will create some simple images of lake, trees and other nature landscape. When I made this game, I actually experienced a lot and struggled a lot. At first, I tried to make a balance between concept and playability. I tried to guarantee that this game is fun to play. 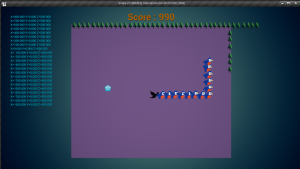 Therefore, I planned to make the game based on Snake game system: the player would try to avoid running into the body or obstacle. This game system would add the difficulty on the game and would require the player to operate more carefully. I spent two weeks to figure out how to make snake game on UE4. I only found two tutorial articles which were not very clear about the specific process. I finally managed to make snake game following the tutorials, but there were still many details that I did not understand. So, it was hard for me to add animation and story based on the system. Besides technique problems, what confused me and made struggle most was the conflict between storytelling and game system. In the play test, because I did not add storyline, all the testers would ask me what the story in the game was and why I chose Snake Game system. I explained that I had not added storyline and I chose snake game system because it added difficulty for the player who thought the next bird collected would cause all the birds leave the wild goose and tried to avoid more birds. However, as I explained, I myself began to doubt it. For this game, I wanted to create an experience for the players to experience the dilemma between emotional need and morality choice. Therefore, it should totally be that the players made decisions according to their thoughts on the dilemma between emotional need and morality choice generated from the situations and experience the story according to the decisions. The snake game weakened the player’ s initiative to make choices and so greatly changed the meaning of the whole game. Thus, eventually I decided to get rid of the snake game system. At the present, the birds will follow the wild goose naturally. And I made the map very big and empty to emphasize the lioness and the sense of companion from other birds. Also, I added many interaction elements, like flower for the wild goose to take and give to the swan, as well as the tree that the sparrow will fly around. These elements enrich the content and create more clues and space for the player to imagine and make story, and so enrich the player’ s emotional experience. The new game system gives the player a great deal of freedom to explore and make decisions, totally serving for the storytelling. Also I found that the comments on the game were very different. For some testers, they could not understand the game without my explanation. And so they are very confusing about what was happening in the game and even thought it was very boring. After hearing my explanation, they thought the story was very good. And for some players, they could understand my game without explanation, and they thought if would be good if I did not explain the story and leave the space for them to imagine the story. I used this kind of very personal storytelling on purpose because I did want the players to explore and experience by themselves. But inevitably, some players might not understand at all. So if I introduce the game to others, I might explain a little bit of my concept behind the game to guide the player, because I do want them to have the feeling of make choices between emotional need and morality. This game still leaves a lot to improve. The biggest problem is the details of storytelling. Though I aimed to make the storytelling very personal and obscure, leaving the space for the player to imagine, there are still some places that are too unclear and most of them are due to technique problems. For example, the wild goose meets some little birds in a rainy day. When the wild goose gets to a big tree, all the little birds suddenly disappear. I wanted to say that the wild goose helps the little birds find a tree to hide from rain and all birds hide into that tree. This part is too confusing. In addition, I used 2D pixel art for the game and I think it may be better to use 3D to enhance the sense of loneliness (I got inspiration from Jenova Chen’ s “Cloud”). I am still very confused about the ending. In the proposal, I planned that the game will not have an ending. The game would be similar to “No Man’ s sky”, that I created a lot of elements and in every pieces of story I randomly combine the elements. Thus, the player would experience the endless pieces of story. But I just do not know how to achieve it, so for now I have an ending that the wild goose eventually meets other wild goose. As I playtest, the tester thought that this ending means that the loneliness should be eliminated by family. Because other birds that leave the wild goose, they are in the end with the same birds. After experience the whole trip, the wild goose understands that the ultimate destination is home. I personally very like this interpretation but I think this ending has a very strong tend of suggesting the importance of family. All in all, I struggle to change my view of playability and greatly improve my understanding of game as art when I did this game, especially in the last few days when I did the new game system. I think I have successfully pushed the game to the boundary with my efforts. This is a game doubting the definition of “existing”. When we talk about our identifiation, what do we mean? The physical body; the invisible consciousness; both of them; or neither of them? In a extreme situation, this game, when the consciousness of humans can be duplicated; when we are forced to face the consciousness with no physical bodies to hold; and when we are forced to act as one of these consciousness, how do we define the real self? The game concept is inspired by the TV series Black Mirror: White Christmas Special. In this game, the player acts as a duplicated consciousness of himself, and is asked by a mysterious voice in the air, to “escape from this room” and “never follow my life”. He needs to enter three passwords in PC to escape, and the passwords are hidden in specific objects this room. Everytime the player gets touched with one of these objects, a scene of memory will be triggered, and the player will walk around, explore, and gradually find out the password. In the very end of the game, after the player has entered all the three passwords, he will be led to an area of codes. In this area, the player is told the truth, by that mysterious voice, that he acts as the “duplication of himself”, which means a series of codes in AI. His job is to serve himself (the real one), and act as a personal assistant at home, which is a service provided in 2100. The owner of the voice, is the duplication before him. The password the player enters, leads to not only exit, but also destruction of code. So why does the previous duplication intend to do this? Because “to live like a duplication is a slavery”; “to live and serve like a robot is something worse than death”. The great escape is planned by the previous duplication. Though the previous duplication is “dead”, but he managed to leave his will in the system. This will not only belongs to the previous duplication, but also, should belong to the duplication played by the player, and every duplication from now on. Though they are independent, they are from the same body. We human, even when our physical body is vanished and robbed, we always go for the freedom. I believe the game meets 85% of my expectations. From the very beginning, my biggest goal is to tell this complicated game with profound meaning, as clear as possible. I think the two audio tracks (in the beginning and in the ending) play important roles in achieving this goal. 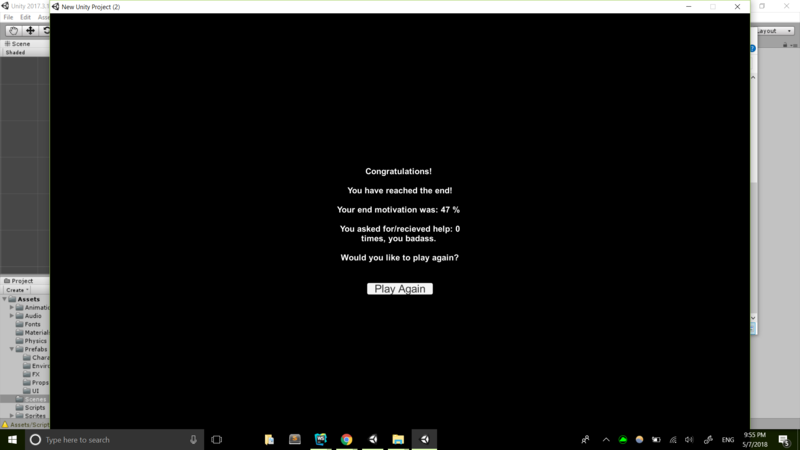 When testing my game with other students, they ususally catch the whole story after they finish the whole game. Also, I think the pixel art I created do meet my expectations. These art assests create a world of mystery and high tech, which strongly emphasize my concept. The thing that didn’t meet my expectation, is the appearance of the player, which obviously affect the concept I want to deliver. In my proposal documentation, I intended to set the player as a ball-shape creature, so that the player can get a rough idea that “he is not acting like a human”. When building the game, I also thought of making the game as a “real first person”, which means that the player can see his shadow on ground, his feet and his body, however, he cannot see his head (the situation in real life!) I checked some tutorials online, however, I did not manage to create them. In the game now, the player acts as a grey human body, which definitely may confuse them about the role. Also, considering the game play, I’m not very satisfied with the way that the player interact with the objects in room. For my final project, I continued my work on the Gold Mining game in hopes of achieving a playable model which included all the functional aspects I aspired to get working. To reiterate, the concept of this game is to replicate something called ‘Galamsey’ or illegal gold mining as we call it in my home country Ghana. As a nation with rich resources but limited ownership of those resources, opportunities to earn money are few and far between. Ghana, like many other African nations has been plagued by British colonization, and still suffers the effects from colonialism today. One way Ghanaians are attempting to move forward is by engaging in Galamsey, but it’s very dangerous. Authorities have been cracking down on Galamseyers heavily as of late, thus making it a risky job. Those who are doing it have few other options and most of them have families to feed and bills to pay. My aim is to create a game that replicates the experience of a Galamseyer, mining for gold in the ruthless and difficult environment. Ideally, the game would be in 2d platformer format, with a simple player bouncing throughout the harsh environment. The main gist of the game would be to make it difficult to attain the gold, and easy to lose it. Thus, I will design the enemy script in such a way that it serves as a strong boundary between the Galamseyer and the gold. Furthermore, the enemy script will also deplete the gold supply on contact, thus emphasizing how easy it is to lose it. In building out this concept, I experienced many shortcomings, most of which were due to the technical knowledge barrier. 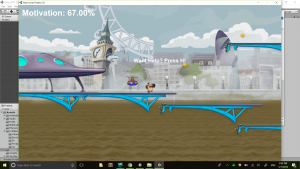 I learned how to deisgn this game as I went along, and there was a great deal of troubleshooting involved while following along with several tutorials. I bounced between about 4 or 5 simple 2d platformer tutorials, most of which either had components or functions that didn’t work with my version of unity. Finally, I found a very simple one that worked properly, and thus I spent days on end learning its in and outs and using the components to program the functions I planned to use. I decided to keep the design and aesthetic simple to begin with, using only 2d components for the characters and gameplay environment. In doing so, I intended to place more energy and emphasis on the deeper meaning behind the game, rather than on aesthetics. I successfully created the simple character with platforms for him to bounce on, as well as some barriers and obstacles throughout the gameplay environment. I was also able to create the enemy script which made it difficult for the player to navigate the gameplay area. The coin collection and counting script was also successful, along with designing the enemy script to deplete coin supply on contact. Given more time, I would begin enhancing the game by further developing the environment to look like a gold mine as well as placing more obstacles around it. The enemy script would also be further developed to strategically deplete the coin supply. As I mentioned before, many of my shortcomings while designing this game were due to lack of knowledge about game design and the learning curve of game design in Unity. These in no way hindered my ability to be successful, since I am proud to have achieved a working model, but I am deeply interested in further developing it to match my vision more closely. For the final project, I will create a new art game, and I haven’t decided the title yet. You, the player, wake up in your house —— the living room, but you find everything extremely big. There must be something wrong! As you start to walk around. A voice in the air, machinery voice made by computer, start to tell you something very confusing. The voice call you “serial 004”, and asks you to exit the house as soon as possible, because there’s a hidden and cruel secret. To exit the room, the first step the voice tells you, is to move to the computer, and open a folder called “exit”, there you need a password of three numbers to exit. The voice will also tell you that, to find the password, you have to find clues in this room. At this moment, player must be very confused about what they are, however the instruction is clear and doable, so they can follow the instruction and start to make some assumptions. It is also clear that the game is a room escape game, so they are free to explore. I have set three objects in the room that give hints to the password, all three objects will lead to new maps that include the password. In a super advanced society, there’s a service called “personal assistant”, basically, it’s someone buys this service, and his consciousness will be copied and squeezed into a machine(thus become a robot). This duplicated consciousness, is there to serve his owner. After all, who knows you better than yourself? This consciousness is set to adjust moisture at home; play background music; arrange breakfasts; set AC temperature… This consciousness is highly independent and can be considered as “you” without physical body. 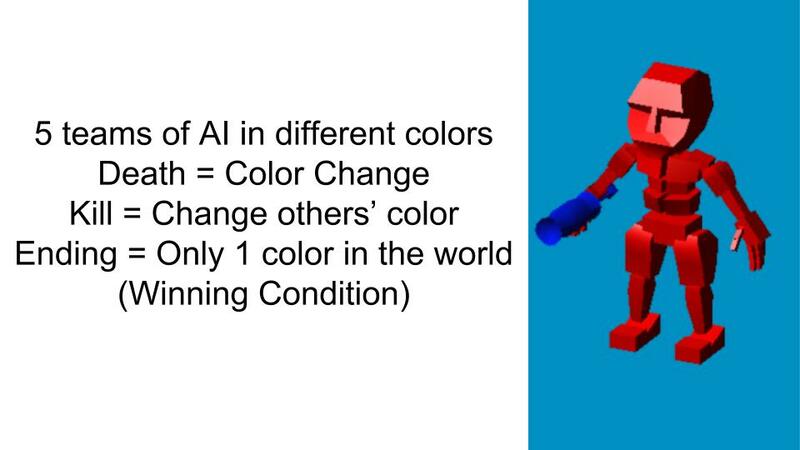 In this game, the player is actually this duplicated consciousness. The voice that gives instruction, is the message the previous consciousness left. So after the player successfully escape from the room, what faces him is actually the destruction. The previous consciousness is there to help player get “destroyed”, because “you” believe that a person, though without a physical body, cannot be slaved even at ease. It’s better to die than being slaved. This belief in inplanted in your every consciousness, though they are destroyed as codes after they exit one by one, however, they still strive for true freedom. The game is a 3D first person one. In the game the player can use arrows to walk around. I will use unreal to make the game, and I’ve created some models before, I want to revise them and make the whole game fluent. The main purpose of the game is to show that one can dream of a bright future all they want, but unless they take action in reality, they will never reach any goal they set for themselves. I want to create an experience that makes the audience understand the difference between dreams and reality. In order to do so I plan on making the game have several brief but important cutscenes between the levels. While the bulk of the gameplay will be in the dreams, where he achieves great accomplishments, by the end of each level it cuts to the character’s waking face and the setting he wakes up to, which is far subpar to the standards he lives in in his dreams. I want to stick to using a 3D side-scroller as I did for my midterm but depending on how things pan out I may want to change it to a 3rd person “front-scroller” sort of game. Essentially, it’d be developed the same way as my midterm was except the camera would be facing his back so that it is significantly easier to see where everything is. A good example of it would be “Temple Run” on the phone. I could also do a mixture of different perspective types between different levels. As for aesthetic approach I want to make his reality grayscale and plain, to show the poor reality of his life whereas his dreams are brightly colored, vivid, and exciting. For now, I have plans for three levels: one where he “saves the princess” like in Mario, representing success in finding a relationship, another would be chasing down a winning lottery ticket lost in the wind, representing wealth, and finally one where he defeats some sort of villain and takes their fort, again, much like Mario and Bowser. Each time the level ends, the cutscene reveals more and more of his real life and finally ends when the sad but complete picture of his reality is revealed. For my midterm, one of the main complaints of the game was that there was very hard to tell where to go because obstacles as well as the front of the building would obstruct view of where to go. Because of this I knew that I wanted to design the game to be a straight forward side-scroller this time to remove the need for any forward/backward movement and therefore a second layer of depth to the maps. As for the story, I wanted the contrast to be gradual, with each cutscene revealing more of the main character’s life in reality. I started the intro with a simple pan towards his sleeping head, as if you were entering his mind. Originally I had plans to make the first level about a girl who gets taken by some bad guys and you would need to fight enemies while also navigating the map. This however, proved to be much harder to do than expected and after my original copy of the game broke, I put it towards the bottom of the list of priorities for the game. To compensate, I changed it to having the girl hanging off the edge of a building and the objective to find your way up in order to save her. Through a good amount of frustration I found myself improving my ability to use the node based scripting of Unreal Engine 4. In the first level there are shipping crates lifting up and down and a street with cars flying through as obstacles. The main problem that I faced in this level was finding a way to trigger an animation at the end. Because triggers in the engine seem to only affect the stats of the trigger and whatever hits it, it was impossible to find a solution to the problem of affecting a third model. After this level, a new cutscene would appear. As the night is over in reality, the main character turns over in his bed and reaches for someone who isn’t there. Though I used the base character provided by unreal, I think it serves the purpose I wanted to display. The same goes for the cutscene after the second level where he retrieves a lost winning lottery ticket and becomes wealthy. In the cutscene afterwards, it leads right to where the last cutscene leaves off. Even though, originally, I wanted the “dreams” to all be real dreams that he had at night, I soon realized that these levels of his dreams can be daydreams as well that he suddenly imagines as he goes about his daily routine. In order to contradict his dream of wealth, he walks into his living room which is fairly bare and seems rather dilapidated. I believe that it not only shows the difference of his wealth in reality, but also his charisma and drive to live well. As he sits down in his living room chair, he begins the third level. This one is much more of a fantasy than the other levels as he takes over the castle of an enemy. As he stands above the castle in glory, it suddenly cuts to the final cutscene of his reality. It is a view from outside his house where you see the shoddy little home and condition he truly lives in. I wanted to create this story because I have a big appreciation for stories that are realistic in the sense that everyone daydreams, and dreams of themselves as bigger and better versions of themselves. I wanted to share this story to inspire people to remember that no matter how vividly you can dream of yourself as a big success, it does not mean that you are guaranteed it. As my mother would always tell me as a child, “I’ll judge you from your actions, not what you say or promise.” I’ve taken this line to heart and remind myself of this line nearly every day. Therefore, I wanted to spread the message that if one wants to turn their dreams to reality, action is the only way. Sadly, I was not able to complete everything I wanted to create in this game. Although I felt in my heart that I would be able to manage all my other projects along with this one, in the end, it was not realistic, especially after my initial copy became corrupt and unopenable and I had to restart from scratch. Since the story was the most important part to me, I focused on finishing the cutscenes first and then the actual levels themselves and finally the little details of visuals, etc. I did not realize that the blueprint/nodes would be as irritating as they are, and had to work my way around many complications, but overall, it had become a very good experience for me in learning the engine.